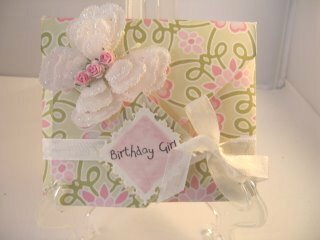 It is always much nicer to give a simple gift card in a pretty way and this is another fold that will produce that for you. I have used a large 12" x 12" sheet of paper for my envelope but it is a good quality weight. And double sided patterns make it even prettier. It can be made from smaller paper if you prefer and obviously it will produce a smaller envelope. Just make sure that the paper is an exact square before you start whatever size envelope you wish to make and try to keep your folds neat and level as you go along. This image would be just right for a teenage girl. I hope you will give this easy fold a try and please don't forget to add your photos to the Gallery page. I cannot tell you this enough times and that is that you should enjoy all your cardmaking. It should always be a fun time for you to express your creativity and not an occasion for you to get stressed about.